Will the god king's army win? or will ghengis' army win.... and once it gets down to the two emperors on a one on one... which king would be the last man standing? mongolia. 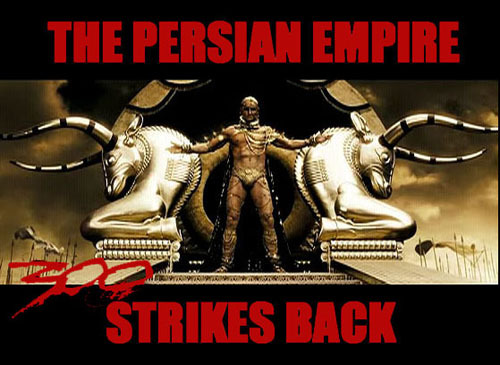 Simply because the 300 version of persia was incredibly stupid. Ghengis Khan and the Mongolians wins this. Easily. Their horsemen were the best in the ancient world. Persia was one of the Empires that fell under the Mongols. It was and still is (in official history) the largest Empire in the Entire world. The closest largest empire next to the Mongol Empire with the King still living would have to be Alexander the Great's Empire. And then 3rd would be the Japanese Empire. The Roman Empire would actually be 2nd... But it's size fluctuated due to the different Ceasers of different time lines.. The Mongols owned Persia..Mongolia was the largest empire ever.Khan wins. "The Mongols owned Persia..Mongolia was the largest empire ever.Khan wins." Incorrect the British empire at it's peak was over 11 million square miles larger. "Persia was one of the Empires that fell under the Mongols. It was and still is (in official history) the largest Empire in the Entire world. The closest largest empire next to the Mongol Empire with the King still living would have to be Alexander the Great's Empire. Mongolia was second to the british empire. Third largest was the russian empire at it's peak. when you say the brittish empire... are you adding take overs spanning back from the times of the cursade wars to the time of the colonly of the americas? how big is the american empire now?